Bespoke Guttering are the UK’s number one suppliers and installers of seamless aluminium guttering. Specialising in a number of colours and style ranges, including our most popular Ogee profiles. Whether your a tradesman or local resident we are sure to have the seamless guttering solution you need. In addition, our seamless aluminium gutters are the only type approved by the BBA (British Board of Agreement & Standards). Whatever the type or age of the property, you can be rest assured we will have a rainwater system to match. In fact we are the preferred contractor for wide range of clientele, which includes: architects, designers, property developers, local authorities, residential, industrial and commercial customers. Whats more, all of our seamless aluminium gutters come with a market leading 30 Years Guarantee. We supply and fit both seamless and sectional, whatever suits your needs. Our certified seamless guttering team are fully mobile and will transport our state of the art gutter cutting machine to your site or home. We then precision cut and manufacture each section of seamless aluminium to length from our profiled coils. All continuous metal guttering lengths of gutter are produced without any joints. Wastage is of course kept to an absolute minimum, therefore meaning we can pass on this cost savings to you. These are extruded guttering roll formed from Superior Hydro coat Textured 800 Aluminium 0.9mm thick, H45 Coil 3105 grade. Complimented with aluminium copings, corners, hoppers and end caps. As with all our seamless aluminium guttering systems there are no seams meaning no chance of leaks. We supply and fit our seamless gutters to all sites and properties throughout London and the Home counties. This includes; Surrey, Sussex, Kent, Essex, Middlesex, Hampshire, Berkshire and Buckinghamshire. Market leading 30 years guarantee. Aluminium Seamless Guttering can be installed up to lengths of 30 meters without any joints. Maintenance free – scratch resistant, hydro powder coated, no re-painting. No joints mean No leaks. Environmentally friendly – high grade recycled aluminium coils are used. 125mm catchment area – greater capacity and allows for a better flow. Our sectional aluminum gutters can be produced in any RAL colour. Our aluminium seamless gutters can be produced in RAL 7016 Anthracite Grey, RAL 9005 Jet Black, RAL 910 White. Undecided? 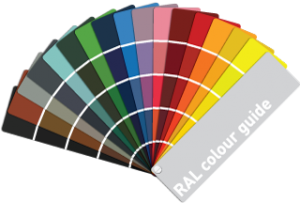 Don’t worry we can advise on which colour and style may be most suitable for your property. 150mm x 130mm: 150mm catchment area and 120mm being the back edge of the height. With this sizing of gutter we would normally be used on bigger properties i.e. office blocks, schools, commercial buildings, and even some of the large residential properties. Our company maintains a perfect customer satisfaction rate and we pride ourselves on providing excellent customer service complimented by fantastic prices. We do not comprise on quality and workmanship. With professional attitude and technical expertise we ensure our customers are 100% happy with our seamless guttering products and after sales customer care. In fact we are so confident in our service and products that we provide a our workmanship and guarantee!